Put the almond flour & flax on a plate. Add a little salt/pepper/paprika to the plate. In a bowl, mix wine, honey mustard, capers, balsamic vinegar, and lime juice. Add to the pan with the cutlets. Heat on low or simmer. Add capers and a sprinkle of cheese at the end. Saute the onion. Add eggplant and mushroom. Add the rest of the basil & parsley mixture. Add the chili sauce. cook until veggies are soft. Serve 1/4 cup of the veggie mixture on a plate. Add cutlet on top. Garnish with capers and herbs. 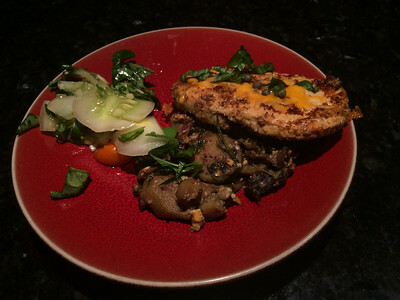 This entry was posted in CSA, garden produce, low carb, main dish, Recipes, vegan, vegetarian and tagged CSA, eggplant, garden, saltimbocca, vegetarian. Bookmark the permalink.